Our home, probably one of the original village houses, is the traditional white clapboard with dark green shutters and a red barn out back. We have added a deck with a picnic table which makes a great place to sit in the sun and drink morning coffee or to have a candlelight dinner at night. From the deck, you look out over the musterfield (yes, where the militia mustered), a long open space with raspberry bushes along one side and apple trees along the other. Neighbors are close enough to wave hello, but still have privacy. Across a field to your left there is a high bank above a wide brook. You can hear the water running over the stones all day and all night. This is the Ball Mountain Brook that flooded during Hurricane Irene. The banks have been repaired and replanted and the new winding course of the river has been allowed to stay, which means that the next time we get a hurricane that sits right on our watershed, the flood will slow down and spread out. The house is small but has many windows so as the sun moves across the sky, there is always light shining on the floor. Parking is never a problem; just pull over beside the house. Most people enter from the deck. Coming in from the deck, you are in the kitchen. It's a long narrow room with blue walls, three windows and a small table for eating in or cooking. The laundry, to your right, shares space with pantry shelves. The dining room has an expanding table that can seat 8-10 people. One door from the dining room opens onto a small covered back porch, a good place to sit and take off your ski boots or stand your skiis. Another door goes into the bathroom (shower, sink, toilet). Two other doors lead across to the living room, or you can make a left turn into the master bedroom. You can also open a door and go down into the cellar. We often show people the cellar because it gives you an idea of how old the house is: the walls are made of river stones. The master bedroom has three windows, one facing east that catches the first sun rising in the morning. There are two dressers in that room. The living room has a comfortable, newly re-upholstered couch and overstuffed armchair faciing a wood stove. if you enter from Factory street (named for a chair factory that stood long ago where the street meets the brook), you have the living room to your right, the dining room to your left, and the stairs in front of you. At the top of the stairs is a small bathroom with a sink and toilet. To your right upstairs is a room with two single beds and a desk. We use this room as a study and a child's bedroom. To your left is a long room with only one window that has a queen futon bed. We call this the chimney room because the old chimney runs up through it. The character of the house is an old New England family house. Nothing in it is from Ikea. The main pieces of furniture are sturdy enough and comfortable, but some others, mostly in corners, show their age. When we decided to try renting our house, we went through the extensive inspection and upgrading process required in Vermont called Essential Maintenance Practices. This includes wired-in smoke detectors, railings, fire extinguishers, and, among other things, lead inspection and remediation. All the painted buildings in Vermont built before lead paint was banned for household use in 1978 probably have lead paint in them. The Vermont standards are higher than Federal Lead Safe Housing standards. Our house has been inspected, remediated (including extensive new painting of both house and barn) and is in compliance with lead-safe maintenance practices. We are a retired academic couple. Our family bought this house in the 1950s and has been very involved in the life of the village over the years. We spend the rest of the year in California. Tenants will be provided with contact information of craftsmen. We have a property manager in Jamaica who will take care of mowing and plowing. Out of every window you can see mountains. The rivers - this is an important aspect of Vermont economic development policy - are clean and swimmable. In the summer, there are music and theater festivals all over the place, Brattleboro is a center of creativity for young musicians and artists. Manchester, just to the north, has serious outlet shopping. Stratton (fifteen minutes) and Mt Snow (twenty minutes) are major ski areas. Having a home which is both in the village at the same time as it has a lot of privacy and a feeling of being out in the country is unique. On the one hand, you can go next door to the D&K general store and buy just about anything you want, including today's NYTimes. Because you're on a town street, you don't have to worry about getting snowed in and waiting for someone to come plough you out. On the other hand, you have quiet and privacy. Downstairs bathroom has shower (no tub). Upstairs half bath, toilet and sink. Downtown Jamaica means a general store where you can buy staples, gourmet foods and wine/beer as well as fireworks and fishing poles. There is a PO, a B&B, a yoga studio, and a new coffee shop. House is sited on old musterfield, which then became town baseball field. Apple trees at edge of property. The house is tucked away behind the general store, screened by lilacs and looking across to the river and mountains. The town is a small, close-knit old community of year-rounders. The house is in the center of a small valley with steep mountains on both sides. Boiler in basement; hot water baseboard throughout house. Uses oil fuel. Various kinds of coffee makers, including drip cones, papers and plug-in pot. Some basic staples will be on shelves; feel free to use. Dining room is next to kitchen. Table expands to seat 8. Plenty of chairs. Check cabinets on back porch for toys. Although this little house is right in the center of the village (in fact, if you walk up the road 50 yards you are at the General Store) it overlooks the old musterfield and the river and feels as if it's out in the country. Thus it combines easy access to everything you need with peace, quiet and privacy. We are a retired academic couple who live in the San Francisco Bay Area most of the year. We come here regularly with grandchildren, and rent it out while we are away. We loved our stay in Jamaica. Great communication from owner. Charming historic home. We frequented the general store for fresh, hot coffee all day long. Bought beautiful glass pieces from Hot Glass Works and Hank himself recommended a cute place called Honeypie to grab a burger. They had the best maple shakes we have ever tasted! Next time we will remember our yoga mats and take a class at Change yoga studio. Don’t miss hiking Jamaica State Park just a short walk down the road! Thank you for the great plugs for the village. Please come again. Rustic, quirky and quaint -- all that a Vermont vacation property should be! I stayed here with my son, his girlfriend and her cockapoo (small dog), making it our base while we explored the villages and hiking trails in the area. On the plus side: lots of room, and a real homey feel with old books, old photographs that made me wish the owner was there to share some history. Possible negatives (OK with us): simple amenities, small kitchen. We highly recommend this place for families or groups up to six. This is a very accurate review! Note that the beds for two of the hypothetical 6 guests are singles. Also, there is a TV screen but it's not hooked up to cable, so you need to plug your laptop up to the HDMI cable (in the drawer next to the sofa, it not actually hanging off the TV screen) to watch Netflix et al. Or pop in a DVD. What I did not expect was the charm and history in the house and surrounding area. Although we’ve stayed in Jamaica many times, this was the first time we rented a house. There are little family heirlooms tucked in here and there. China and tea cups in an antique built-in cabinet. Monogrammed Silverware in the utility drawer. Old books lined the bookshelves upstairs and down. Nothing fancy here, just an enjoyable step back in time. Jamaica Village is a sweet town and a central location for skiing, antiquing, outlet shopping, breweries, etc. We walked to Jamaica State Park from the house and walked along the level river trail along the West River. D&K grocery is directly behind the house with an amazing assortment. If D&K doesn’t have it, you don’t need it. (And try their freshly baked Morning Glory bread. It’s delicious!) We had yummy breakfast sandwiches from Workhorse Cafe and we were sorry to see North Country General was still going through renovations and hope to see them up and running for our next trip to Jamaica. All in all, we enjoyed our stay at hullabaloo house and plan to return again! Rent, refresh and return is our motto for Hullabaloo House. Thank you for the appreciative and realistic review. Your assessment of the amenities of our house is just what I hope people experience. The two single beds in one of the upstairs rooms are really for children or teenagers; I'll try to make that clearer in my description for future guests. Great Getaway in rural Vermont! Staying here in this home, town and area was like stepping back in time. Step out the door and hear the nearby river, walk next door to the local D+K Village market for anything you might need and lots of great bakery items. Explore the area - flat walking along rivers (Jamaica State Park) or hiking up mountains. This home is centrally located and has everything you need to relax and quiet to get a good sleep! The owner is very responsive and the caretaker was helpful. 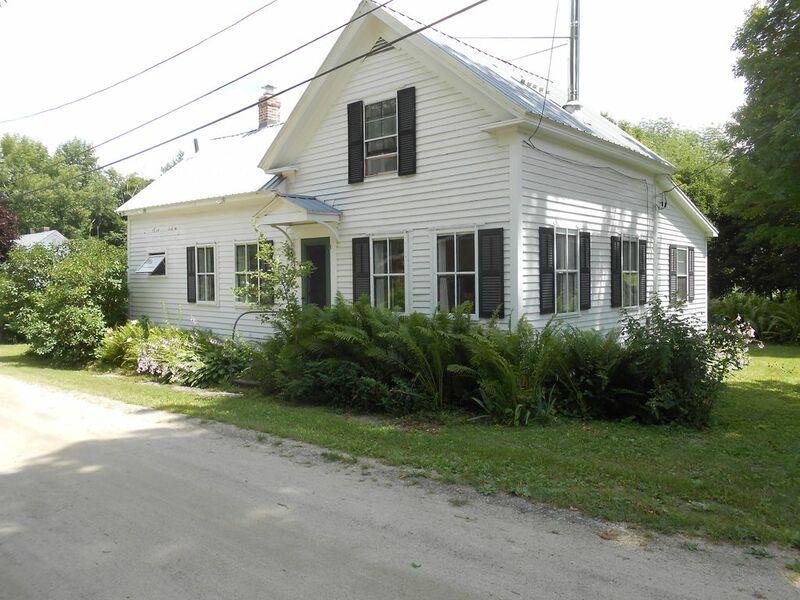 I would recommend this property and I recommend you to visit this area of Vermont! Very sweet and comfortable home. Great location near all the things we love to do in the area. We've been vacationing in the area over 20 years. Stayed in this home the past two. We will be booking again for next year. A wonderful house. We enjoyed our stay so much and attended Pikes Falls Chamber Music Festival! Beautiful house and property with such a wonderful ambience! Jamaica is a tiny town on the edge of the Green Mountains, 15 minutes from Stratton base lodge and 20 minutes from Mt Snow ski areas, 23 miles north of Brattleboro (exit off Rte 91). it is in the center of a lively youth arts-and-music area. Summer is full of music festivals and summer stock theaters. Kayakers (skilled ones!) zip down the rivers. Cycling clubs spin up and down Route 30. Fall is for brilliant leaf color, and winter is for skiing, downhill and cross country. Jamaica State Park is ten minutes walk from the house and has the West River Valley trail (old railroad right of way) for cross-country skiing. Payment is due upon finalizing the reservation. It covers electricity, wifi, heat and propane for the stove and one clean-up after you leave, so no additional payments should be required. During the winter, wifi, elect and propane are included but heating oil is billed separately, and can range from $100 - $300 per month depending on the temperature. Cancellation policy: No cancellations for summer rentals. Once a reservation has been made and paid for, that time has been reserved. However, if a substitute renter is found to take your place, you will get your payment back in full minus tax and $100 cleaning fee. I will re-open the vacancy on VRBO to find a substitute renter.